Social media excitement doesn’t always equal ratings. ABC: The Internet may have been broken by the first 3 hours of the epic season finale to THE BACHELOR, and the night’s rating at 2.2 was up 0.4 from last week. However, that was still down half a point from the 2017 edition. 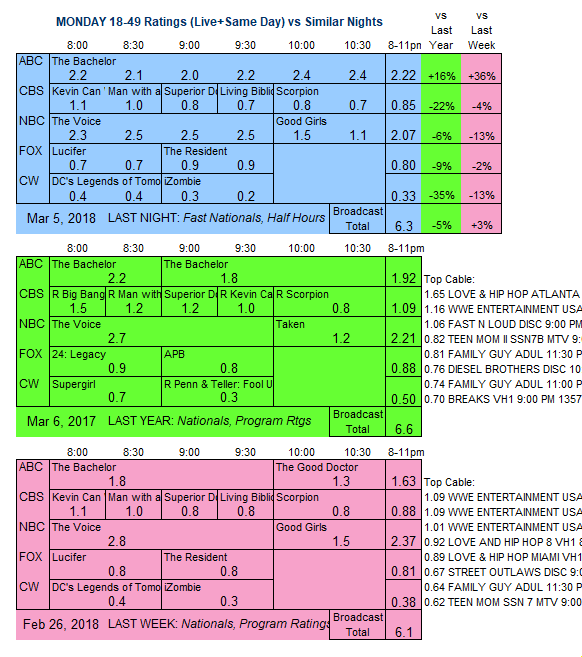 CBS: LIVING BIBLICALLY fell 0.1 to 0.7, while KEVIN CAN WAIT (1.1), MAN WITH A PLAN (1.0), SUPERIOR DONUTS (0.8) and SCORPION (0.8) were all steady. FOX: LUCIFER lost 0.1 to 0.7, while THE RESIDENT gained 0.1 to 0.9. 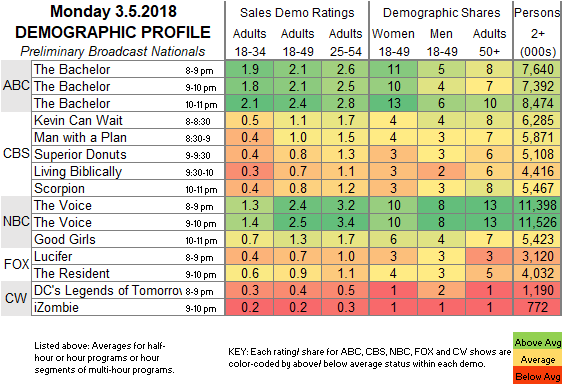 CW: LEGENDS OF TOMORROW held at 0.4, and IZOMBIE dropped 0.1 to 0.2. The rest of the finale of THE BACHELOR airs tonight, followed by what will probably be the final finale of KEVIN (PROBABLY) SAVES THE WORLD.